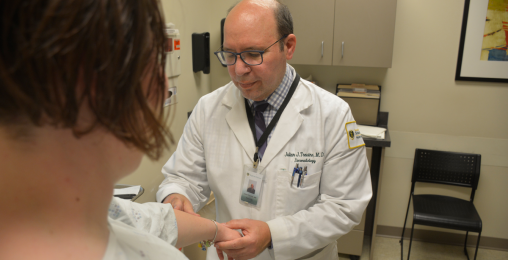 Julian Trevino, chair of dermatology at the Boonshoft School of Medicine, has organized the free skin cancer screening event for more than 20 years. As part of Melanoma/Skin Cancer Detection and Prevention Month, local Dayton-area dermatologists will offer free skin cancer screenings to raise awareness of melanoma and other types of skin cancers during the week of May 6-10. Morning and afternoon appointments will be available at locations throughout the region. The free screenings are sponsored by the Wright State University Boonshoft School of Medicine Department of Dermatology, Wright State Physicians and Premier Health along with the American Academy of Dermatology and Eucerin. Appointments are required. To schedule an appointment, call CareFinders at 1-866-608-3463. Screenings will be held at Atrium Medical Center, Coffman Family YMCA, Premier Health Urgent Care, Miami Valley Hospital Sleep Center Dayton, Upper Valley Medical Center Cancer Care Center Dugan Infusion Center and Wright State Physicians Health Center.